ABOUT a week before closing, we were getting hit with heavy rain. The Realtor called me to say she could unlock the house so we could look for leaks and attempt any repairs that would prevent the already-bad condition from getting worse. 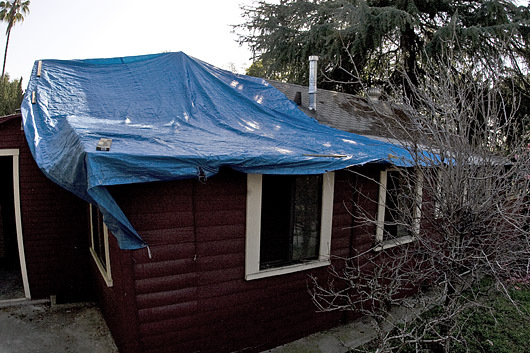 Along the side of the house, I found a big blue tarp that had blown off months before. It was still in good shape, so I rolled it up and prepared to climb on the roof to reattach it before the sprinkle turned to a downpour. Mark had bought the tarp about four years earlier. I remember going up on his roof that first time to unfold the giant, blue plastic sheet. 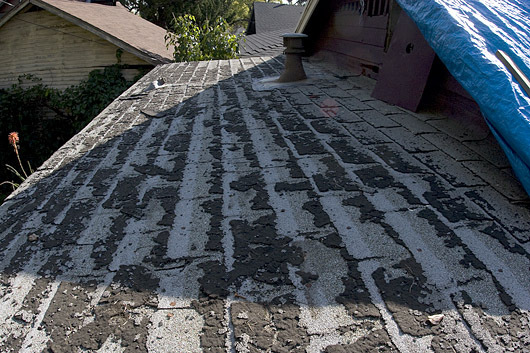 The shingles beneath were crumbling, and the soft rain was coating the tarp making it especially slick. Mark, with his stiff plastic leg and liquor-augmented agility climbed onto the roof after me. I talked him into staying on the lower, flat section as images of ambulances and stretchers traveled through my head. When we were done with our makeshift repairs, it resembled a poor-man’s Christo, but it kept the water out. That roof became Mark’s downfall. Well, the roof and the rapidly ballooning economy. Around 2006, his house was worth close to a half-million dollars. On paper, he was the richest guy on government assistance I knew. In reality, that house was all that stood between Mark and transience. Like everyone in the country who had equity in a home at the time, Mark started to get a substantial amount of mail and even phone solicitations promising cheap loans. After one of these calls or letters, he’d sometimes visit me asking if I’d help him fill out the forms. I’d always say something to the effect of, “Why are you borrowing money?” His answer was always the same, starting out a little defensively, he’d complain about never having money in his pocket, not having a car — in truth, he wasn’t allowed to drive, having been convicted on so many DWIs. Eventually, seeing that he was gaining no traction with me, his argument would always lead to his leaking roof. Each time, I’d try to explain that getting a loan and paying for a loan were two very different things. I’d suggest that he get a checking account to deposit his small government check into, that each month, he could try to set aside $100 or $200, and at the end of the year, he and I would go get tar paper and shingles and put a new roof on his place. Temporarily encouraged, he’d fold up his papers, thank me and leave. A few weeks later, I’d follow up, but he never could gather himself to get a bank account, let alone set aside any bit of the $800 that came in each month. After several months, I stopped hearing about the loans. I took it as a sign that Mark had given up on that idea, and patted myself on the back for having helped him avoid the clutches of our dysfunctional lending system.